It was love at first sight! I remembered when I first saw them a couple of years ago at Bakerzin, Millenia Walk, I was immediately captivated by the myriad of colours these petite pastries are available in. Especially those in pastel yellow, pink and orange! So pretty! Looking so curious indeed! Back then very few places made these and they were not as popular as what we see today! 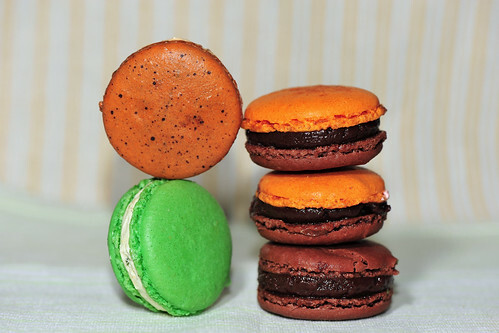 My first true encounter with macarons are from Amande Bakery located just next to Toa Payoh Hub 2-3 years back. This place created quite a sensation amongst the local foodies then as it was the amongst the first to bring these delicate french delights into the heartland. I distinctively remembered one which had a deep and rich cassis shade. Can’t remember now if it had cassis-flavoured filling but it sure was sweet! Sugoii amai! I remembered cringing a bit upon sinking my teeth into one for the very first time. Way too sugary, even for a dessert lover like me. 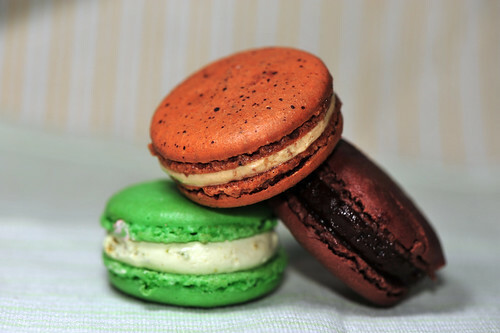 So somehow, I put off the idea of trying out macarons again over these 2 years despite coming across them numerous times in pâtisseries all over the island. I’m still mesmerised by their appearance; small circular almond biscuits with glossy crisp tops and little crackled protrusions near the base known as “feet”! Simply delightful! Our membership subscription for Bakerzin came with half a dozen of macarons for free! 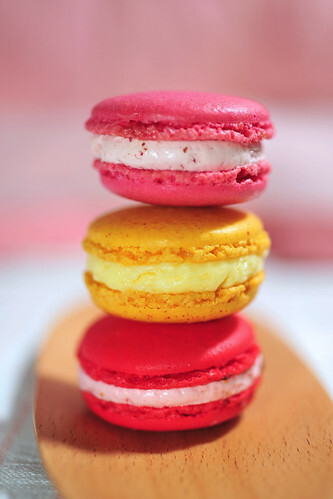 This gave us the opportunity to try out macarons again. Something which I’d been avoiding for the last two years. I guess it no escaping this time! The starting of this food blog brought me back to the realms of French baking and here I am, a vis-à-vis encounter with macarons once again! I began to read up on them and naturally, the great Parisian pâtisserier Pierre Hermé and his strong cult following of sweet-toothed enthusiasts from all over the world popped up! 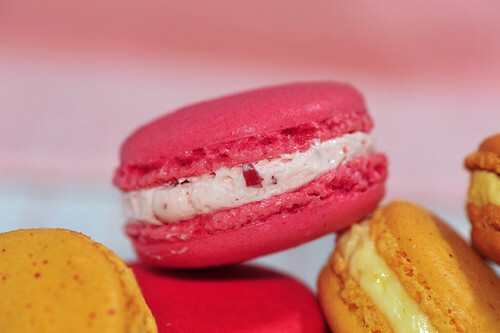 A visit to one of his dessert boutiques in Paris must be one of those things on the “101 Places to Visit Before I Die” list for macaron aficionados. This entry was posted on December 27, 2010 by Alan (travellingfoodies). It was filed under Food and was tagged with Amande Bakery, Bakerzin, macarons, pâtisserie, Pierre Hermé.